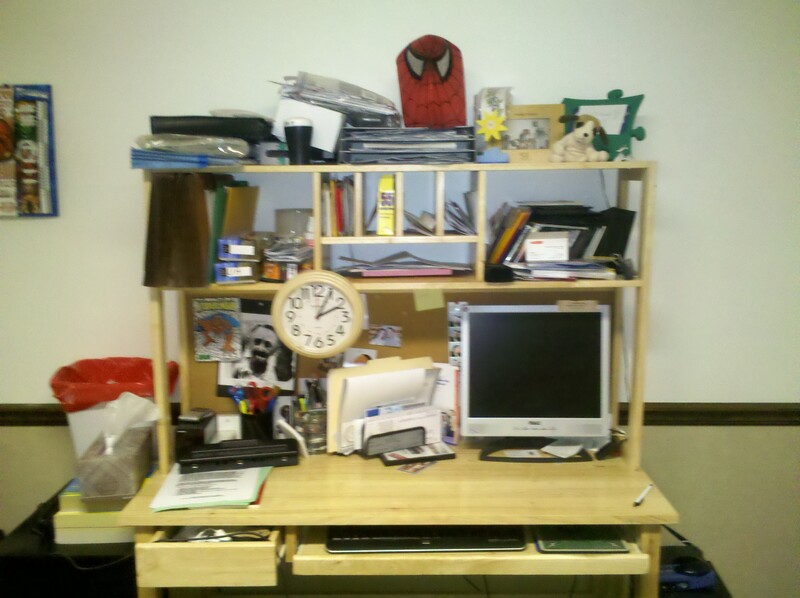 One of my NY resolutions was to get the house de-cluttered and organized, in preparation for moving this summer. I got a couple more projects done this week. Monday, after I had officially signed off from the computer and called it “a day” in terms of work, I decided the first order of business was to clean up my work area. 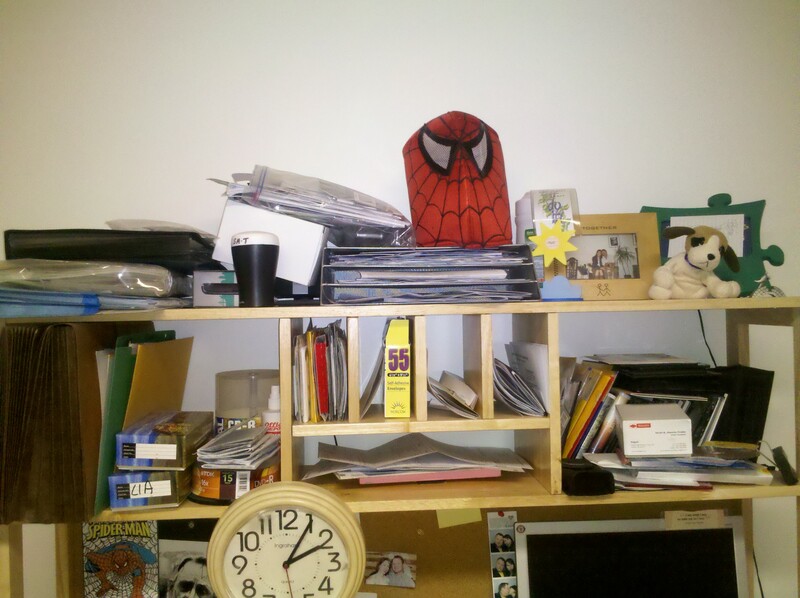 As I was sitting at the desk all day working, I started looking around at how cluttered it was. And it was getting to me. I don’t normally spend a full 8 hours at this desk so it’s easier to overlook it. But yesterday I decided it was time to tackle the desk as my next Operation Dream Home project. Gag. How embarrassing. 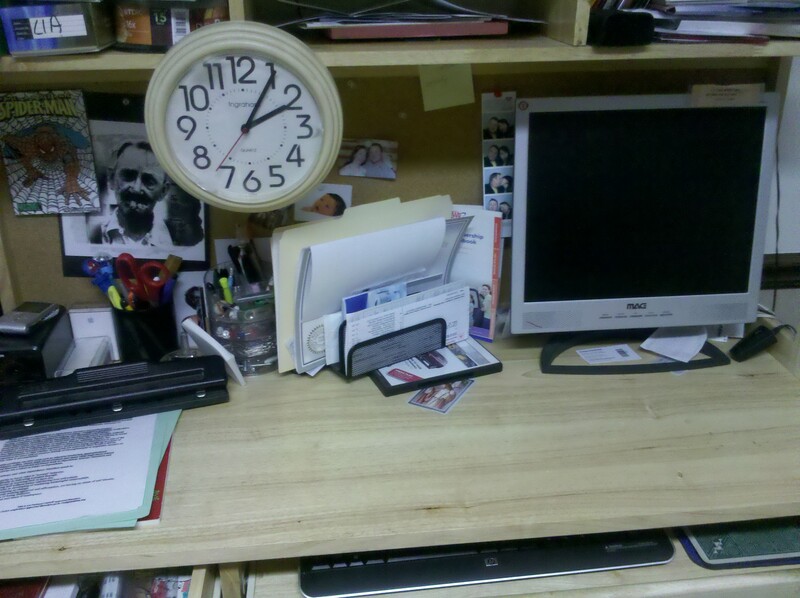 This embodies the epitome of clutter in my mind. And it drives. me. crazy. I started with the shelves. On the right side you can see a whole gaggle of CDs and pictures piled up and stuffed in there. I went through those and determined what should be kept and what should be tossed. Most all the pics got tossed because they were doubles of ones I’ve already scrapbooked. Many of the CDs were tossed too as they contained old computer backups or programs which I no longer needed. The remaining CDs got consolidated into one of the black sleeves that can hold multiples (we have 2 cases – one holds 36 CD/DVDs and the other holds 24). At some point I’ll probably take the data that’s on those and transfer it to one of our external hard drives. But that will have to be another project. I then consolidated the bills/files (which is the middle area). Instead of having them stacked hither and yon, I gave them designated cubicles/slots. I also shredded a TON of stuff (I don’t think I need to keep my pay stubs from 2007…). From there, I started filing away the user manuals/warranties that we need to keep. They were previously stuck up on the left side of the top shelf. I put them in expandable files and all of those got place in the large open area on the left side. 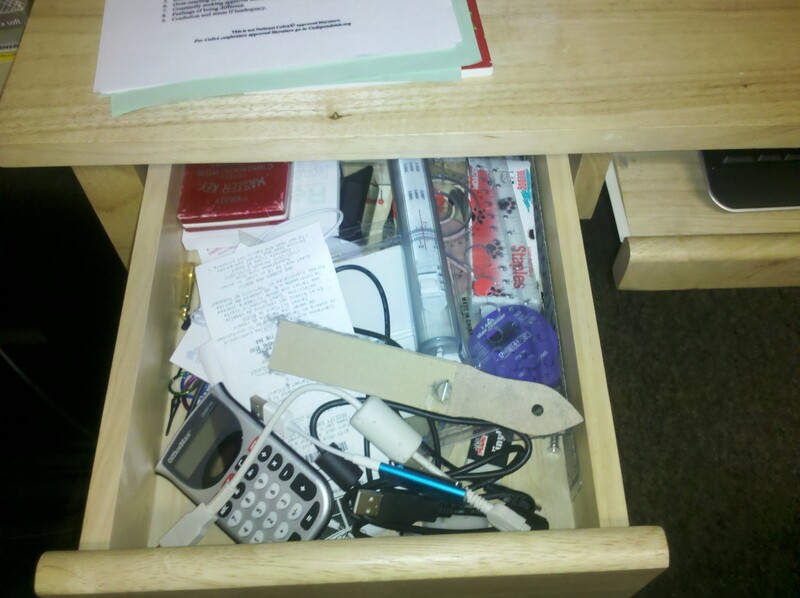 Then I tackled the drawer. Most of the stuff in there was random little things that we don’t need. A lot got tossed. The rest got sorted and organized into containers. 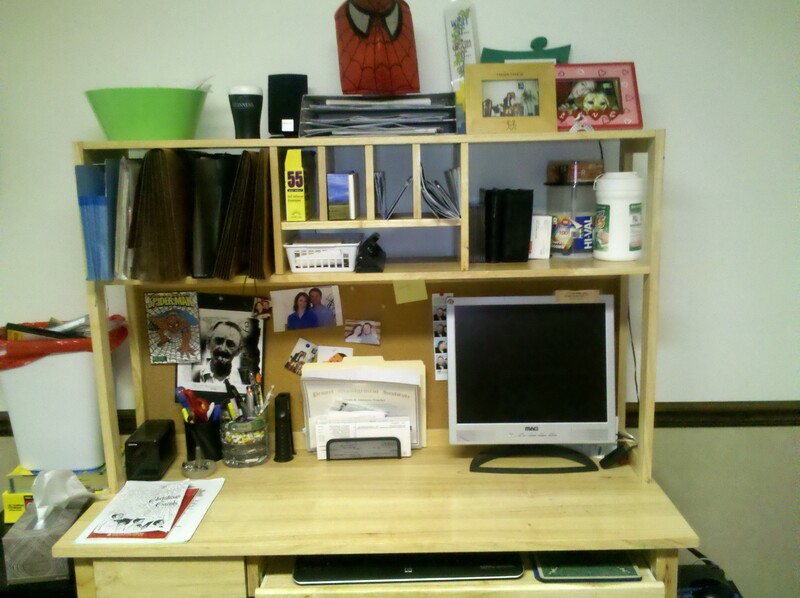 Then the desk itself got arranged a little neater. That’s pretty much it! I think it looks much better. While there is still a lot of stuff there, it’s all organized and tidy now, which makes me feel much better. CJ said he didn’t notice much difference (until I kicked him in the shin and then he suddenly noticed), but I can see it and feel much better. 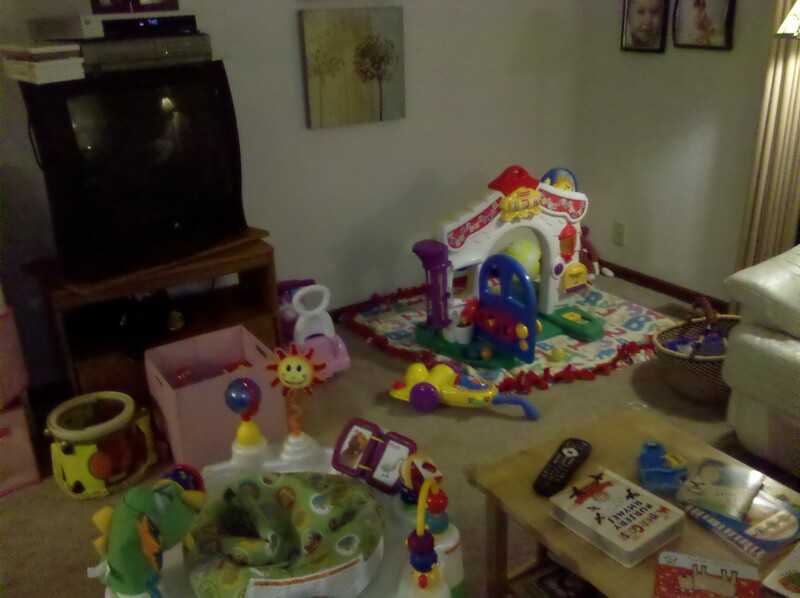 Then last night I decided to organized the play area in the living room. Stuff everywhere and it was driving. me. crazy. Target had organizers on sale so I ran out and got one for $30. I put it together and got everything organized in about 2 hours. Much better right? The little OCD girl inside of me was squealing with delight last night. 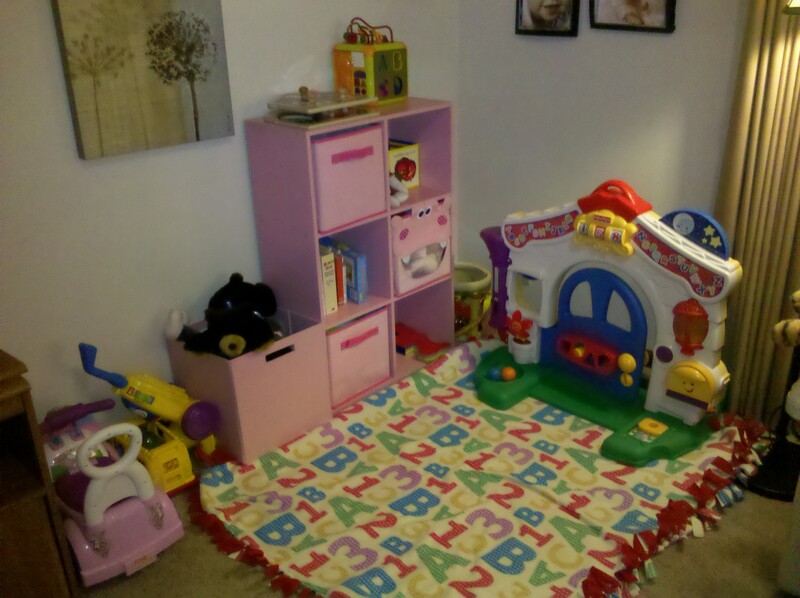 It’s not only organized but it’s cute too (Isabella loves the “hippo” bin)! Don’t worry, I know that it won’t stay this neat and tidy and I’m totally cool with that. So long as everything has a place to go back to at the end of the day, I’m a happy camper. Note: I put the shelves together last night after Munchkin went to bed and it involved a lot of hammering. CJ was vacuuming at the same time. She slept through all of it and the woke up 15 min. after we were done because she couldn’t find her woobie. I love to see progress and am really happy that these projects are getting done slowly but surely. Go me!